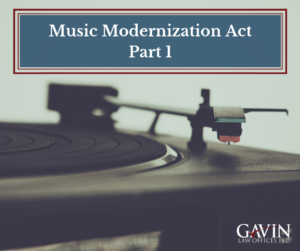 Concluding our coverage of the Music Modernization Act (MMA), this article explores the final Title III of the bill, the “Allocation for Music Products Act” or AMP Act. (To read more about the bill generally, visit the prior blogs Title I and Title II.) Whereas the other two titles have focused primarily on songwriters and musicians, the AMP Act is the Copyright Act’s effort to recognize the roles of producers, mixers, and sound engineers in the creation and production of a sound recording by granting them a statutory right to royalties in from digital performance services. Critically, thanks to the AMP Act, producers, mixers, and sound engineers will not need to enter into contracts that explicitly establish compensation for digital transmissions. As reported by IP Law Watch, the AMP Act “codifies the requested royalty allocations from artists to studio professionals that SoundExchange has honored since 2004. (For more information see S. Rept. 115-339 (115th Congress Sept. 17, 2018) (Report of the Committee on the Judiciary to accompany S. 2823, The Music Modernization Act). In particular, the AMP Act allows SoundExchange to receive a “letter of direction” from an artist to “distribute, to a producer, mixer, or sound engineer who was part of the creative process that created a sound recording, a portion of the payments to which the payee would otherwise be entitled from the licensing of transmissions of the sound recording.” Although similar allocations are already in place for many, if not most, sound recordings after 1995, this authorization granted by the AMP Act is unique as it enables a more direct, and ideally efficient, process. Because SoundExchange mainly handles sound recordings created after 1995, the AMP Act provides guidance for sound recordings predating November 1, 1995. For these sound recordings, producers, mixers and sound engineers may receive a distribution of 2% of collected receipts from licensing transmissions of the sound recording as deducted from the amounts payable to the artist provided that the producer, mixer, or sound engineer can evidence a failed attempt to obtain a “letter of direction” from the artist. In addition to these requirements, producers, mixers, and sound engineers would not be immediately entitled to the 2% distribution—there would be an “objection period” in which an artist or owner of the sound recording could raise objections. There is one minor wrinkle to the above guidelines for sound recordings fixed before November 1, 1995: the relevant sections of the AMP Act—Section 114(g)(5)(B) (pre-1995 recordings) and Section 114(g)(6)(E)(right to receive payments)—do not go into effect until January 1, 2020. This delay is not a bad thing though; rather, it is to provide SoundExchange the necessary time to prepare and upgrade its own internal processes to best accommodate the AMP Act. SoundExchange is a non-profit collective rights management organization designated by Congress to collect and distribute digital performance royalties for sound recordings. While Title I was concerned about contemporary songwriters and their publishers, Title II, as its name may suggest, is interested in the past. In particular, Title II allows for songwriters and record labels to obtain compensation for music sound recordings created before 1972. This is important because 1972 was the year that federal copyright protection was first extended to music sound recordings; as such, compensation claims for music sound recordings made before 1972 are only covered by state laws, and the states have been anything but consistent in this area. The CLASSICS Act presents a clean solution to this problem by requiring digital music services to provide notice, track, and pay royalties, just as they would for music sound recordings made after 1972. In addition, the CLASSICS Act will create “a digital performance right in favor of rights owners of sound recordings recorded before February 15, 1972 (and after January 1, 1923).” That is, in the event there is no separate voluntary license between the sound recording rights owner and the digital service, the royalties will be calculated and paid under the same system that is applied to works made after 1972. See IP Law Watch for more information. The CLASSICS Act includes two final details that are relatively unique. First, the act provides protection for pre-1972 sound recordings as calculated by 95 years from initial publication. It is therefore possible sound recordings can gain an additional period of 3-15 years worth of copyright protection, depending on how recently the song was published. Second, and perhaps more peculiar, is that the CLASSICS Act provides an approach to “orphan works,” that is, music sound recordings for which an owner cannot be identified. The CLASSICS Act will permit “certain noncommercial uses of sound recordings that are not being commercially exploited,” so long as the person engaging in the use makes a good faith, reasonable search for, but does not find, the owner of such sound recording and notice is provided to the Copyright Office. GLO readers, did you take advantage of any Black Friday and Cyber Monday deals? Millions shop, billions have been spent, and businesses may be thinking of ways to use “Black Friday” and “Cyber Monday” to promote the sales that their companies will have on these days. The question is – When it comes to trademarks and potential infringement, should companies be worried about using these terms in their marketing? Using catchy phrases and slogans can create a lasting image with customers and allows companies to create brand recognition and increase the potential for sales. Acquiring trademarks for a business’s intellectual property protects a business from copycats and provides legal remedies. Companies (some more than others) diligently patrol the use of their trademarks and pursue infringement not just for monetary damages, but so that they do not lose their trademark or its marketing power. The short answer to whether companies should be worried about receiving a cease and desist letter or otherwise for using “Black Friday” or “Cyber Monday” in their marketing is: probably not. However, it is worthwhile to understand why this is, and when businesses do need to worry. Why are “Black Friday” and “Cyber Monday” okay for businesses? If a business had to avoid using “Black Friday” or “Cyber Monday” the way they evade using “Super Bowl” and “March Madness” in their advertisements, no one would be able to refer to their sale as the “Black Friday Sale”, or “Black Friday Deals”. However, it turns out that no one has control of these terms in the same broad way that other companies have over trademarks. A search for “Black Friday” on the U.S. Trademark Database reveals 38 “Black Friday” trademarks or marks using “Black Friday” with another word or term (ex: Black Friday Store). The live marks for “Black Friday” include one for a beer, a computer game, and an individual in Cleveland, Ohio for advertising and marketing services. 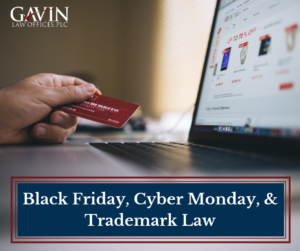 These examples help demonstrate an important principle of trademark law— trademarks only cover the registered use of a specific good or service – meaning that unless someone uses Black Friday to market a beer, computer program, or advertising services, they are likely not going to run into any problems. A search for “Cyber Monday” turns up no trademark for the exact phrase, though there are several variations (ex: TGI Cyber Monday). So, why has no one else registered Black Friday or Cyber Monday as a trademark? Depending on who you ask, many say that “Black Friday” originated in Philadelphia as a phrase used to describe post-Thanksgiving traffic. Over time, it developed into a colloquialism for retail services the day after Thanksgiving. It may seem like a great idea to register a trademark for “Black Friday” or “Cyber Monday” for everything you can think of so you have a monopoly on the terms. However, you cannot register any phrase you want as a trademark – there are specific rules you must follow. The USPTO does not allow the registration of generic words or phrases. For instance, a company that makes computers cannot trademark the word “computer” to sell its goods. It is considered generic, and too likely to be used in the course of daily business for many businesses in the same industry. A business can use a generic term if it does not fall within the industry, though. For example, Apple Inc. is allowed to use “Apple” and the apple logo to sell computers because the word is not generic for the sale of computers. The word apple makes you think of the brand that sells computers instead of just the fruit, or instead of just computers. Previously inventive terms can also become generic. If due to its popularity or significance, the brand’s trademark has become the generic name for, or synonymous with, a general class of product or service (usually against the intentions of the trademark’s holder) then the company may lose its trademark. Examples of companies that are constantly facing this issue are “Xerox”, “Band-Aid”, and “Kleenex”. The mark BLACK FRIDAY as registered in connection with beer avoids this issue because it is not a generic term for beer. “Black Friday” has become the generic term used for the day for sales after Thanksgiving, and “Cyber Monday” for online sales the following Monday. Therefore, companies may use these terms to promote their own sales on those days with little risk of trademark infringement – no one owns trademarks for that type of use, and likely no one can register the terms due to them being generic promotional terms. While we think of Thanksgiving as a holiday unique to the United States and Canada, it has spread globally, as has the awareness of Black Friday and Black Friday deals. Picking up on this, Hong Kong-based company Super Union Holdings Ltd. (“Super Union”) registered the trademark “Black Friday” in Germany for almost all goods and services. Super Union, not unlike the NFL and NCAA, diligently patrolled the use of its mark, and even more diligently enforced it. When other businesses used “Black Friday”, Super Union sent warnings, and several injunctions to stop using the term were issued. Eventually, companies filed cancellation requests against the registration. PayPal, itself not the target of any enforcement measures, decided to join the cancellation proceedings specifically to take a stand for the rights and interests of retail. One company that filed a complaint stated that “Black Friday” was a purely promotional term in widespread use around the world and well-known in Germany, and that its registration as a trademark was illegitimate in the first place. In April 2018, the German Patent and Trademark Office (DPMA) finally declared the term free for all to use in commerce, signaling the end of Super Union’s trademark monopoly on “Black Friday” in Germany. DPMA considered that lack of distinctiveness, being that the term was generic, was enough to cancel the mark. If this all makes you nervous about whether or not a word or term is a registered trademark or not, here is some advice: if you see the ® for a registered trademark or a ™ for a trademark in the process of being registered, you are being notified that you must not use this trademarked phrase without permission in any other business. The best place to be sure of the status of a phrase or name is the U.S. Patent and Trademark Office (USPTO) website, which anyone can access for free. As always, you should contact an attorney before you use a trademarked word or phrase in commerce to avoid any issues stemming from potential trademark infringement.